My BF went to Blackpool for a couple of nights over half term, with her family. And then popped in to tell me all about the trip yesterday. Where was my stick of seaside rock I wanted to know? That was the only thing they didn’t get around to. Shame! I love me some seaside rock, it’s in my favourite colour after all. Probably just as well for my teeth (and waistline) they forgot but still…shame I say again. Not least because I keep talking to my clients about rock – to some hilarious degree with my Hungarian client last weekend who had absolutely no idea what I was talking about. I like to use rock as a metaphor. If we break you in half, what word is written all the way through? Last Saturday’s client would have said “artist” had she understood the question (!) and today’s client said “spiritual”. 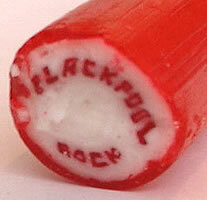 What’s inside your stick of rock, and more importantly… are you living it? If not now, when? OK, OK, I hear you. Maybe we can’t all live our own authentic lives right now or do our own unique thing all day long because some of us round here need to earn a living. But there has to be a flavour of both of those things in the work you love to do, in the business you are creating, otherwise what’s the point? And if you cannot incorporate it into your work right now, if – together – we haven’t yet found a way, then you have to be living it anyway. You have to live being an artist, you have to live being spiritual, because that’s just who you are. You have to be real and not hide from your authentic self. Be who you are. So let’s go back to my stick of rock analogy. What’s in yours? What is it that only you can be? I keep reminding myself and my clients and friends and anyone who’ll listen that each of us is on a unique path. I can’t live your life and you can’t live mine and if either of us fails in that mission, well then our life simply goes unlived. Not entirely, I’ll grant you. Just to its fullest potential. And it’s a crying shame, a criminal waste. So your job is just to be you, live your own authentic life. There’s no competition, we are completely unique. There’s only one vacancy in this life with your name on it. You can make the job your own, as they say on X Factor. It’s all down to you and up to you and there’s plenty of help and support and loads of cheerleaders who want to see you live your best life, despite what they may say and do sometimes. Oh heck, who cares what they say and do and how you are currently distracted by whatever is going on in your life and wherever you are! How can you find just a few moments a day to do you, to be you? Today and every day. That’s what I want for you. I managed to persuade my artist client to commit to putting on her pomodoro timer and just making art for 25 minutes a day. That’s enough for now because I am deeply confident it’s going to go a lot further than – and fast – that if she can just start by making that commitment. Only she can make that art. Only I can write these words. Only you can do your thing. And do you know what? We are gagging for it. Whatever it is and whoever you are, show up. We need your authentic and beautiful and unique you. We need you, and that’s all there is to it.